IF YOU WERE A BOARDER ,YOU MUST REMEMBER THIS. RARE. A pair of handsome colour printed Mezzotint engravings. in excellent condition aside from natural ageing of the wove paper. Published by W.R. Bigg, London, 1 December 1790. Bottom center: Pubd. as the Act directs. Decr.e/y 1st, 1790 by W.R.Bigg No 11, Tavestock Row, Covent garden. 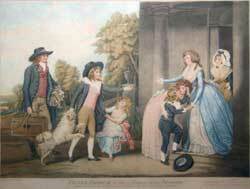 These splendid mezzotint images evocative of "Public school" life are wonderful examples of Bigg's sentimental style of painting and may be of particular interest to Old Wykehamists as the school song is "Dulce Domum", which is sung on the approach of and at the break-up of the school for the Summer holidays. It is also sung at Abingdon School and Stamford School under similar circumstances, and was popular among 19th century English public schoolboys. For example, it is mentioned in the early chapters of Tom Brown's Schooldays. Paradoxically, although the subject of the song is the joy of breaking from the school grind and returning home for the holidays, it is often taken as symbolizing the idyllic, nostalgic view of English public school life in the 19th century. 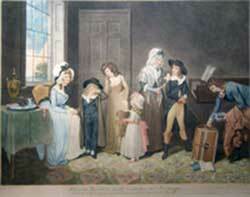 The scene of image 1 (Black Monday) is that of a Georgian parlour or morning room wherein a family have gathered to bid a fond farewell to two sons who are on the point of departing for the school term. The eldest, exhibits the bravado and resignation of one who has been through it all before. He is perhaps even enthusiastic to get back to his chums and studies. His grandmother offers his a few words of encouragement and advice. A manservant bends to retrieve some fallen books and a trunk. A different scenario for his younger brother though, as he fights to hold back his tears, perhaps this is his first term at boarding school. His sisters and mother are attempting to comfort him by pointing out the supply of Tuck that will be accompanying him on his life changing step. His youngest sibling holds a basket of apples and a wrapped cake, whilst his mother slips a silver coin into his palm. I am sure that this will evoke memories in many a former boarding pupil. What a contrast to the scene of image 2 (Dolce Domum) at the pillared doorway of their home. Both lads seem to have grown both in confidence and stature as they are greeted upon their return from school, the elder sister kisses her younger brother, whilst her younger sister tugs at the coattails of her older sibling, the family dog is also effusive in greeting the returning scholar as his mother extends her arm in welcome and grandmother looks on with pride. The manservant carries a seemingly lighter trunk but even more books. William Redmore Bigg (1755-1828) gained a reputation as an excellent genre painter, the sentimental morals and pretty appearance of his accomplished paintings made them extremely popular in their day. In subject and style Bigg echoed the work of his master Edward Penny, who also specialized in painting genre scenes with moralizing overtones. He was a regular exhibitor at the Royal Academy and the British Institution, and proved a continued source of inspiration for contemporary engravers. Bigg remains one of the most celebrated English genre painters whose, picturesque characterizations of the lower classes, express the sentiment and taste of his age. John Jones (Ca.1745-1797) His reputation rests on his mezzotint engravings, some of which are extremely fine and often command very high prices. He also practiced in stipple and produced a large number of plates, chiefly from portraits by Reynolds, Romney and other contemporary painters, which, with a few exceptions, he published himself in Great Portland St, and Tavistock Row Covent Garden, London. He was appointed Engraver to the Prince of Wales and Duke of York.